I first read To Kill a Mockingbird seven years ago. For one reason or another, I never read it in high school; it wasn't until my first teaching position that I had the pleasure. In the time since, I taught the novel 2-4 times a year for five years to my tenth graders. In the past seven years, I've read Mockingbird well over a dozen times. The text moved down to the middle school, and that will make me forever sorry since it was my favorite book to teach. Needless to say, I have a close relationship with the story of Scout, Atticus, and Tom Robinson. I admired the tenacity of the young Jean Louise, Jem's struggle to become a young adult, and Atticus as a paragon of all that's right in the world. In fact, Atticus was my literary god. I used to tell students that when in doubt, Atticus had the answer. Critical Lens essay? Use Atticus' characterization and conflict. SAT essay? Atticus' closing argument will make great evidence for any topic. Have to make a tough decision? WWAD? 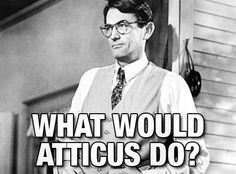 What would Atticus do? Meme via Pinterest. I wish I had this on a t-shirt. 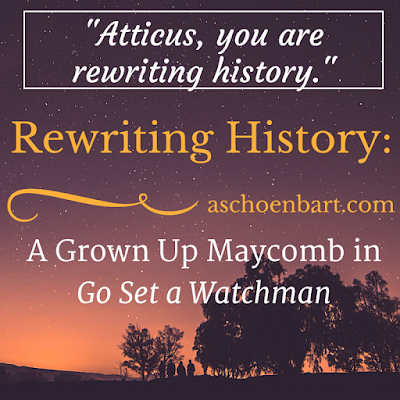 "Atticus, you are rewriting history." However, Watchman isn't the Mockingbird, Maycomb, or Atticus we knew. Scout's line above summed it all up for me. Neither a sequel nor prequel but more of a draft or revision, Watchman truly rewrote history. 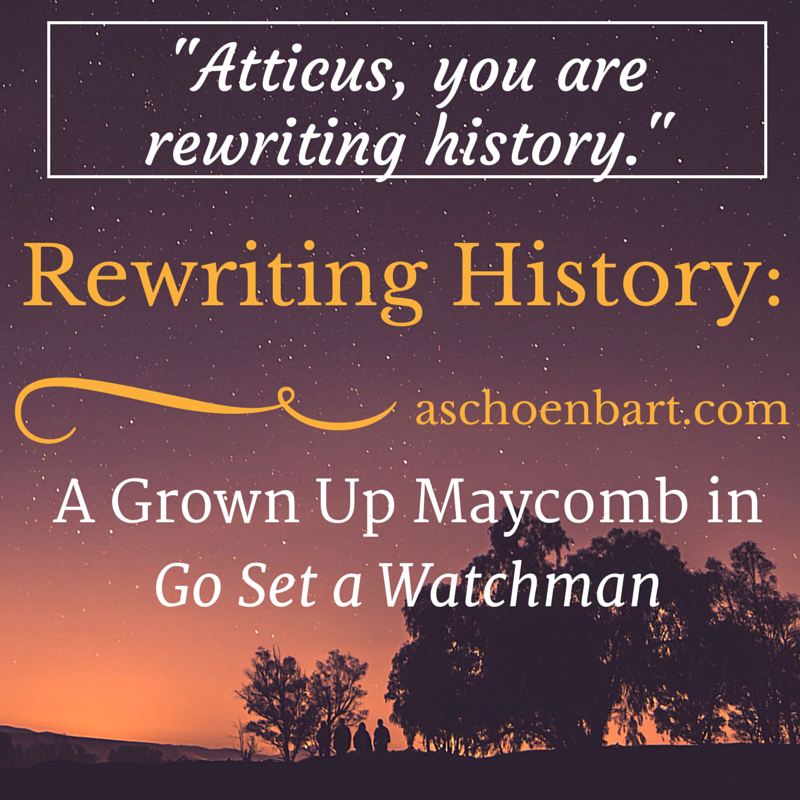 The Atticus Finch of Go Set a Watchman is not the Atticus I came to respect, love, and admire. But neither is his world of Maycomb and its history. Despite being a purported early draft of what became Mockingbird, Watchman is a different text entirely. In an effort to rewrite the novel from the younger Scout's perspective, the story seemed to change. Whether or not this was a conscious effort by Lee to shift the messages of the text is perhaps the most interesting question for me. 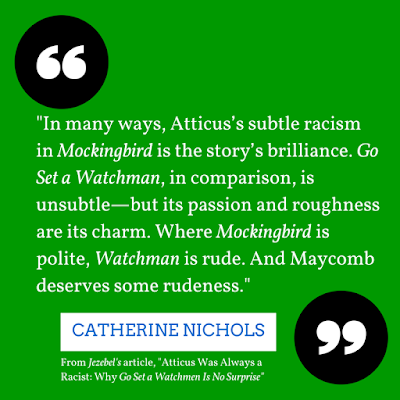 Is it the Atticus of Mockingbird or Watchman who represents the author's true voice? Equal rights for all and special privileges for none, or a much more complex morality tale? To Kill a Mockingbird is Scout's story, and is appropriately written from the perspective of a young girl who has a blind faith in her father, the only true role model she has. In Watchman, Lee writes, "She looked at Maycomb, and her throat tightened: Maycomb was looking back at her. Go away, the old buildings said. There is no place for you here. You are not wanted. We have secrets." The Atticus of Mockingbird is a moral paragon because his young daughter thinks it to be so. Whether or not she is correct is a much more complex question, but the simple fact that the entire story is seem through Scout's eyes adds such moral complexity to it's retelling in the not-so-sequel. Has Atticus changed? Or did we only ever know the Atticus who Scout knew? 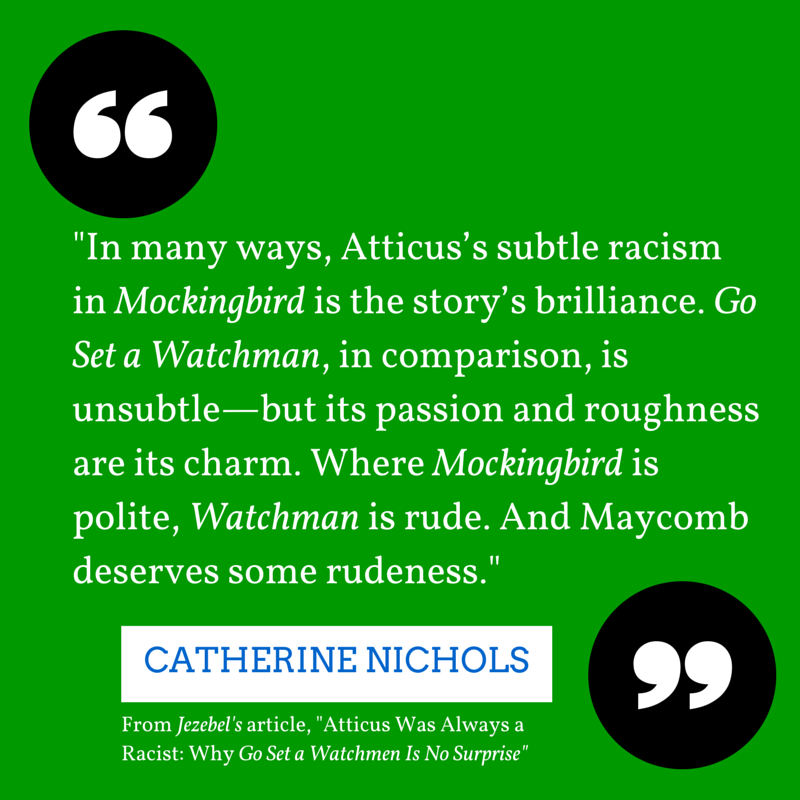 This article from Jezebel's title contends, "Atticus Was Always a Racist: Why Go Set a Watchman Is No Surprise." While I don't agree with everything, it's an interesting take. Who is Atticus Finch? The conflicted, complex, and maybe realistic old man or the dedicated, moral, and just lawyer and father? In Watchman, Atticus tells his daughter, "Jean Louise, I'm only trying to tell you some plain truths. You must see things as they are, as well as they should be." What is the plain truth here? The truth, for me, is that the corruption of Atticus isn't as important to me as the growth of Scout. After all these years, it's now Scout's turn and her real coming of age. Even with her 26-years of wisdom and despite living in the big city of New York, it's coming home that leads to her loss of innocence and reckoning with her father. The trial of Tom Robinson from her childhood no longer has that power since now Atticus won, changing the world of Maycomb we knew. No longer is this story about the coming of age of the precocious young girl but her struggles to reconcile the ideal of Atticus we used to share with the the morally complex old man that only a more adult Scout can begin to understand. Despite the contradictions, confusion, and complexities, I enjoyed Watchman for the most part. I was fascinated by it the whole way through. The adult Jean Louise was a well-realized evolution of the tomboy we know and love, and to see her true coming of age was heartbreaking and nostalgia-ridden. The ideas and even dialogue that called back to Mockingbird both warmed and broke my heart. When Uncle Jack asks her, "What kind of people were we, Jean Louise? What kind of people are we?" and she replies, "I thought we were just people," I wanted to stand up and cheer. While I missed Jem and was desperate to learn the fate of Boo Radley, to read Aunt Alexandra try to again tell Scout about the facts of life and the reality of being a Finch was great. Even better was the realization: "No--I'm quite sure you know those facts already." 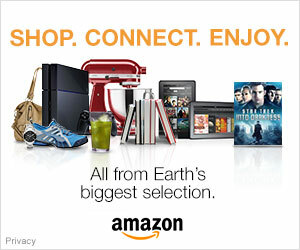 For more reading, here are some interesting articles about Watchman. 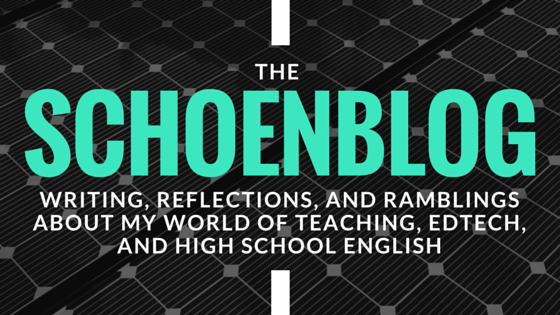 Please share if you have more worthwhile reading or commentary! These characters live in the world of To Kill a Mockingbird that could have been, and maybe almost was. They are the characters as real to me as my friends and colleagues and have aged and grown with heart and wisdom. The evolution--or devolution--of Atticus Finch, too, certainly raises questions and controversy, but adds a complexity that the now adult Scout's journey requires to ring true. In Mockingbird, she came of age in her understanding of race, gender, and identity to the best of her childhood ability. Her father, though, was the admirable but unrealistic static hope of Maycomb. And while I'm not quite sure I like it, the characters are suddenly more real and flawed, living in a world of grey rather than that of black and white from Maycomb long ago. I read Watchman this summer, and was conflicted. For what it's worth, I wish I never saw Maycomb or its characters through and "adult" Scout's eyes. It was her youth, her persistence, and her unfailing curiosity as a young girl that made Mockingbird my favorite book to teach. I still have student who remember acting out key scenes, and one even "busted up a chifarobe"! I'm glad Watchman was not published and the Lee had to sharpen her pencil and write Mockingbird. We are collectively better for it, despite the realities she encounters when returning to Maycomb. Thanks for reading and commenting, John. I appreciate it! I'm so torn between the critical English teacher and devoted fan of Mockingbird. As a fan, I completely agree with you. As the scholar of critical theory, Watchmen absolutely fascinates me through so many lenses. I can't help but try to psychoanalyze the grown up Scout and older Atticus and to examine the book and its changed history through a gendered, post-modern, or deconstructionist lens. I'm not sure I needed the story itself but the process fascinates me. And the moments where Scout really sounded like herself made me smile enough to feel good about the experience. 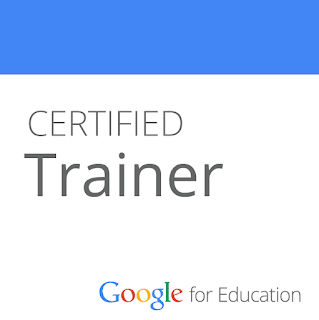 Look forward to talking more soon!